Despite being severely affected by the flash flood, where most of the BOPs are submerged in water, troops of 159 Bn BSF deployed in Lunglei in Mizoram and 131 Bn BSF at Dholchera, Cachar in Assam starts rescue operations in flood affected areas. 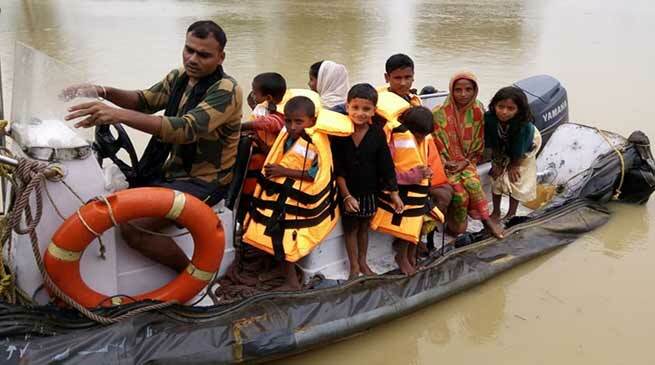 BSF Jawans evacuated men, women, children and aged ailing patients of village to safer places amidst flash flood waters, without caring for their safety and by putting their life at peril. Exhibiting humane approach, the officers and troops of BSF catered much needed potable water and medicare to the affected villagers by associating local civil administration and the NGOs and instilled a sense of confidence among the poor border population. In the last couple of days, torrential and incessant rain lashed border areas of Mizoram and Barak Valley on Indo-Bangladesh border. All rivers of this region and rivulets in the border areas are flowing above danger mark and are in spate. The banks of these rivers are inundated and had turned into like an ocean. The villages on either side of the border are submerged under flood water including villages in Tlabung Sub-Division and Tipperghat of Mizoram and village Nathanpur of Barak Valley and so were BSF border out posts.